In The Foundation (决战玄武门), Michael portrayed Li Sai Man (Li Shi Min) who was the co-founder of the Tang Dynasty. Later known as Emperor Taizong, Li Sai Man was originally a happy-go-lucky young prince who met a servant village girl in his counselor's household (Chun Sik Sik, portrayed by our lovely Barbara). 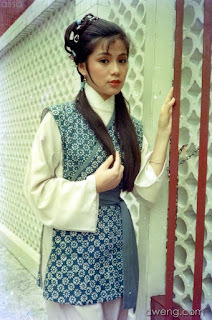 Li Sai Man then fell in love with Sik Sik, the humble village girl who used to love Kong Fung (Felix Wong), a man from her village who left her to improve his kung fu career. Sik Sik then also fell in love with Sai Man and left her love for Kong Fung behind. Have a look at this MV by Thaijet. How beautiful and sad it is...SPOILERS ahead. For those who don't want to be spoiled, don't watch the MV till finished. The music is not the original the Foundation OST. 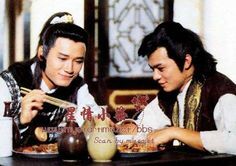 Rather, it was from the Return of Condor Heroes (1983), featuring Andy Lau and Idy Chan. The next MV below the break contains the original OST of the Foundation. Later, the relationship between LSM and Sik Sik became more complicated because Sai Man became involved in the palace politics. He eventually "had" to do something that totally broke my heart and the hearts of so many viewers of this series. Just watch the first MV to see what I mean. And below is the second MV with the OST by Tomoyo262. For those who have watched this series and prefer an alternative, happier ending, TLN of the MB Paradise forum wrote this amazing fanfiction years ago. Go there and have a read. I can't produce a better alternative ending myself. 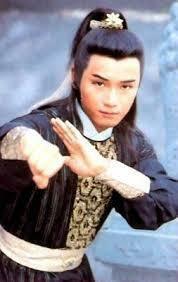 By the way, Chun Sik Sik's white garments reminded me of Xiaolongnu's white ensemble in Return of Condor Heroes 1983. Xiaolongnu (portrayed by Idy Chan in the 1983 series) was the teacher and lover of Yang Guo, Yang Kang's son . Might actually be the same dresses? Or at least the same costume designer? Li Sai Man's wardrobe was gorgeous. It produced a different tone of gorgeousness from Chor Lau Heung's gorgeousness, but still drop dead gorgeous. Tudou has the Cantonese version of the Foundation here. I will try to download them just so that I can listen to Michael/Babs' voices...I have also found a DVD seller in Indonesia that sells the Mandarin-dubbed (palm/face) of the Foundation, with Indonesian subtitle. I will purchase it and in a month or so, provided that I'm not drowned in my own tears, provide the episode summary. Oh yeah. I've been complaining about some Fearless Duo Mandarin-dubbed episodes as well. I just want to say that I do enjoy Mandarin-voiced series (Bu Bu Jing Xin, anyone?). However, after watching CLH 1984 again with Michael's and Barbara's real Cantonese voices, I can't help feeling I much prefer the un-dubbed version of any series. If it's spoken in Cantonese, then for God sake, let it be the voices of the actors and actresses speaking Cantonese that we hear. If it's Mandarin-spoken, then don't dub the actors and actresses. I have a particular problem with this habit/policy with the mainland series, particularly after realising that the film makers extensively dub Nicky Wu's voice for his series. That same dubber also dubs other actors as well, hence one voice is not unique to one actor/actress, which is a shame IMO.